Natural cage for a retic? Thread: Natural cage for a retic? I was wondering if anyone here has ever done a more natural enclosure for something as large as a retic? I work for a guy that owns a few and he does the same paper/Aspen bedding. Doing a very quick Google search, I couldn't seem to find anything from other people doing much else. I know these guys are a bit large and tend to squish any plants, but has anyone else considered doing something other then the standard 6ft enclosure with newspaper? I have a Platinum Golden Child male that I rescued a few years back and he's finally getting some size on him. Well, he's such an impressive snake that I was considering making him more of a display. If anyone has done anything simular, I would love to see an example! Any tips, hints or things to consider would be fantastic. Re: Natural cage for a retic? I had some huge branches screwed into place ( wooden viv )a few years back .. he did enjoy climbing .. I think most people don't keep the adults on natural substrates because of the sheer volume of urine these snakes produce. I've had some of them flood their cages 2, 3, and 4 days after eating, which would require replacing all of the substrate. That's a lot of aspen or cypress mulch to replace every day. I am lucky. Rainbow pees in her swimming areas. Is easy and cheap to empty, clean, and refill them. Oh yeah clean-up is easy when they use the water bowl as a toilet. I've seen large outdoor enclosures and sheds converted into an enclosure that are considered naturalistic. The dimensions for both of these are way larger than most standard retic keepers, so that's probably how they get away with it. I'm not a retic keeper, nor do I plan to be. Way too much snake for me lol. But I've seen it done, so thought I'd mention it. I have seen it done in zoos, but it seems most of them use garden mulch as a substrate, with pots planted under it. Huge branched are bolted to the walls with brackets. Space and cleaning are the main reasons I think you don't see it done that often. I've seen them also. They typically have a lot more floor space and vertical space, like the size of a horse's stall. 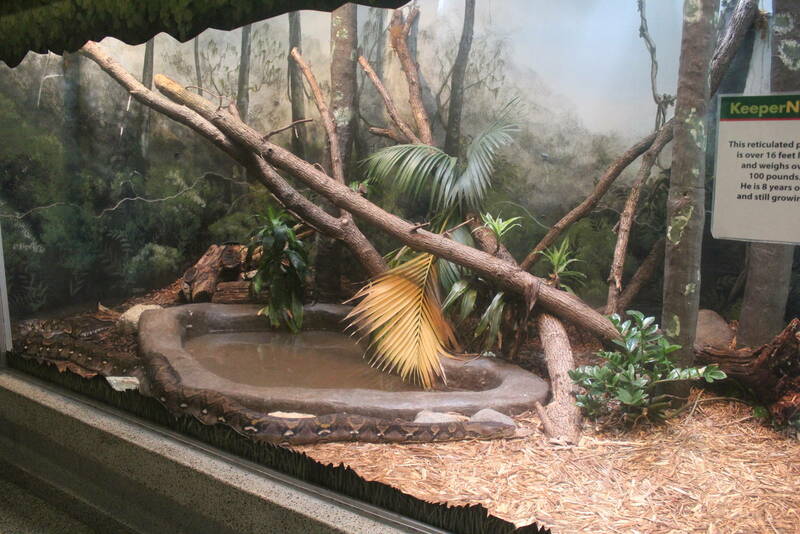 This is the habitat for the retic at the Brookfield Zoo (not my photo). I visit frequently and am always amazed by 1) how ridiculously huge the snake is and 2) how even this large of an enclosure does not seem like enough space. The next time I go I'll try to take some good pictures of all the snakes there.